As a Web UI Engineer – not to be confused with a designer – my job is to craft great web sites, and though web engineering doesn’t involve itself in the artistic side of web development process, an integral part of the job is ensuring that the user experience and application flow makes sense, and that the artwork doesn’t get in the way of the user. That said, it doesn’t mean I don’t have a strong sense of aesthetics, I do, but my focus is on engineering a great user experience. From that perspective, for years I’ve been following the guidance in Steve Krug’s book, “Don’t Make Me Think,” in which he shows example after example of great user experience and posits that the best interfaces are ones which are so self-revealing in how to use them that they don’t require the user to think about what to do; or at least limit the amount of thinking the user has to do to use the interface. So what does this particular subject have to do with guitar gear? Actually lots. Gear manufacturers large and small could learn quite a bit from reading this book. Control interfaces on some amps are so confusing that it makes it extremely difficult to dial in a great tone, and it takes hours to get a feel for them. That’s not necessarily a bad thing because part of the fun of playing around with a new amp is learning its various functions. But sometimes it can be downright frustrating. One manufacturer that I think “gets it” is Hughes and Kettner. Though I don’t own any of their amps, I’ve looked at their control interfaces on their various amps, and it’s easy to figure out. If you look at the HK Switchblade and click on the magnifying glass to view the details, you’ll see what I mean. This is a very sophisticated amp with lots of different features, but they’ve kept the control interface very simple and streamline. That kind of simplicity speaks to me. 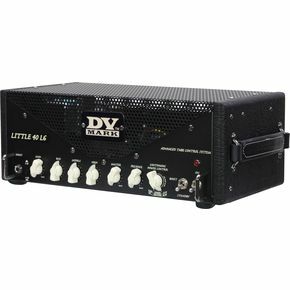 Another manufacturer who “gets it” is DV Mark. The Little 40 is a lesson in “don’t make me think.” The control interface is very simple and straight-forward, but one place where this little amp shines is in swapping power tubes. A feature that sold me was the power tube auto-bias. This amp automatically biases and matches power tubes on a continuous basis to ensure that the power tubes operate at their optimal level as long as the power tubes are matched within 10% of each other. I DIG THIS FEATURE. It means that as long as I buy reasonably matched tubes, I can swap them out at any time, and not have to bias them myself; no chance for operator error! For instance, last week during my church gig, I noticed that the amp was sounding really harsh, and when I cranked the amp up, it occasionally stuttered. So after the gig, I tapped on the power tubes with thin kabob stick, and sure enough one of them was microphonic. So this morning, I took the cover off the amp and swapped out the EL34’s for a pair of awesome Groove Tube 6L6’s which are new production tubes made from NOS parts. I was purely overjoyed that I didn’t have to bias the tubes myself, and that the amp just does it. Talk about not making me think! This was a dream come true! To some, this might be a trivial matter, but admittedly, I’m deathly afraid of screwing around with electronic components and screwing things up. An amp the Little 40 makes tube maintenance absolutely idiot-proof. But on top of that, the amp sounds killer, so needless to say, I’m a happy customer! While I had the cover open, I also decided to swap out the JJ 12AX7’s, with a couple of spare NOS 12AX7’s. I put in a 50’s Bugle Boy and a 1959 RCA 12AX7. oh… My… GAWD!!!! Combined with the GT 6L6’s, the tone of the amp is incredible, with subtle overtones and harmonics that the other tubes didn’t have. When I first put all the tubes in, I couldn’t believe what I was hearing. But I confirmed this by swapping out all the tubes twice! The fundamental tone of the amp with the NOS tubes is basically the same, though the 6L6’s do provide for a bit more headroom as they don’t break up quite as early as the stock EL34’s; plus they don’t seem to compress as much. The preamp tubes really smooth out the front-end breakup, but they also have so much more sonic content – especially in the high frequency range. And when those 6L6’s saturate, the tone becomes almost cello-like. I’m flippin’ out! There is something to be said about NOS tubes. Unlike other things like power or speaker cords that to me are essentially snake oil, at least to me NOS tubes provide a marked difference in tone. All my amps have NOS tubes in them – though I’ve kept the JJ EL84’s in my Aracom PLX18 because they actually sound better to me than NOS EL84’s. One thing that seems to be an earmark with NOS tubes is the smoothness of their breakup. I think that smoothness comes from the higher amount of sonic content that they produce. Especially with preamp tubes, I’ve found new production preamp tubes to be harsh a bit on the harsh side in comparison. Mind you, NOS tubes don’t come cheap. But to me, they’re a solid investment in your tone. Thanks for article! In this week I will change tubes in my DV Mark 403cpc. Finally I’m pretty sure that I don’t have to leave my amp in service and do it on my own:) Best regards! That amp is so cool. Had to do another swap just a few days ago when the amp started making a weird humming sound; and same thing: I just popped the new ones in, let the amp warm up, and I was off to the races!